The above image of CLGMD's main dialog serves as an index to its features. can get CLGMD. Select the Cancel button to go to PARAGLIDE® home page. Selecting the Existing Layer box causes a sorted list of the drawing's layers to be presented. Any layer can be selected from this list but only thawed layers which are not Xref layers can be made the current layer by using the Set To button. When the scroll bar is present there are more choices than can be shown. Scroll down to see more. It is best to make selections from each of the groups to eliminate the need to rely on memory in selecting the proper layer name. Pick OK and the formatted layer for the current selections is made current or created if it does not exist. Return to the Top. used they are automatically included. Selecting the Major Group box causes the Major Group list to be presented. Select any major group from the list. The associated Minor Group list is loaded and set to "No (major group name) Minor Group Selected". Each major group has its own minor group list. If the Major Group options are not sufficient for your needs, more can be added by selecting the EDIT Major Group button on the main dialog. The "Append Tab-Tab" button appends the required tab-tab after the major group letter. (Pressing the tab key while in the dialog just moves the cursor to the next tab stop). Selecting the Linetype box causes the linetype list to be presented. Select any linetype from the list and it will be reflected in the modified CLG layer name format. The modification places a single character in position #2 of the Long Format CLG layer name and, if used, in position # 6 of the Short Format CLG Layer name. An Edit Linetype dialog is not provided for linetype, however the list may be easily customized using a text editor. Detailed instructions are provided here. 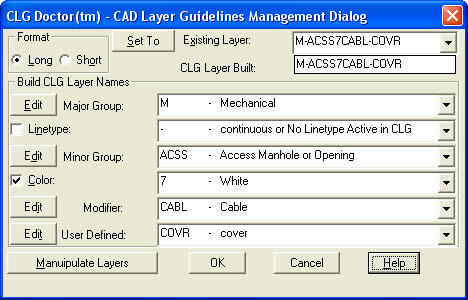 Select "- continuous or No Linetype Active in CLG" to leave the CLG layer unmodified. Selecting the Minor Group causes the minor group list to be presented. Select any minor group from the list. When the scroll bar is present there are more choices than can be shown. Scroll down to see more. If the Minor Group options are insufficient for your needs, more can be added by selecting the EDIT Minor Group button on the main dialog. The "Append Tab-Tab" button appends the required tab-tab after the minor group. (Pressing the tab key while in the dialog just moves the cursor to the next tab stop). Selecting the Color box causes the color list to be presented. Select any color from the list and it will be reflected in the modified CLG layer name format. The modification places a single character in position #7 of the Long Format CLG layer name and, if used, in position #7 of the Short Format CLG Layer name. Because only a single character is provided to indicate color there are a limited number of color ID's available. All of them after 9 must be alphabetic characters. If it is necessary to specify color for Color plots with many layers it may be best to specify colors in the User Defined group. An Edit Color dialog is not provided for color, however the list may be easily customized using a text editor. Detailed instructions are provided here. Select "- No Color Active (default white, no CLG option)" to leave the CLG layer unmodified. Selecting the Modifier Group box causes the Modifier Group list to be presented. Select any modifier from the list. When the scroll bar is present there are more choices than can be shown. Scroll down to see more. If the Modifier Group options are insufficient for your needs, more can be added by selecting the EDIT Minor Group button on the main dialog. The "Append Tab-Tab" button appends the required tab-tab after the modifier characters. (Pressing the tab key while in the dialog just moves the cursor to the next tab stop). Selecting the User Defined box causes the user defined list to be presented. Select any user definition from the list. When the scroll bar is present there are more choices than can be shown. Scroll down to see more. If the User Defined options are insufficient for your needs, more can be added by selecting the EDIT User Defined button on the main dialog. The "Append Tab-Tab" button appends the required tab-tab after the user defined characters. (Pressing the tab key while in the dialog just moves the cursor to the next tab stop). at the select prompt or pervious if no other selections were made since creating the selection set. Invalid settings are ignored (i.e., current layer frozen). See the AutoCAD help file for instructions in wildcard use. You may open this dialog independently with the command MANCLG after clg.vlx has been loaded.